There are several different types of hernia. 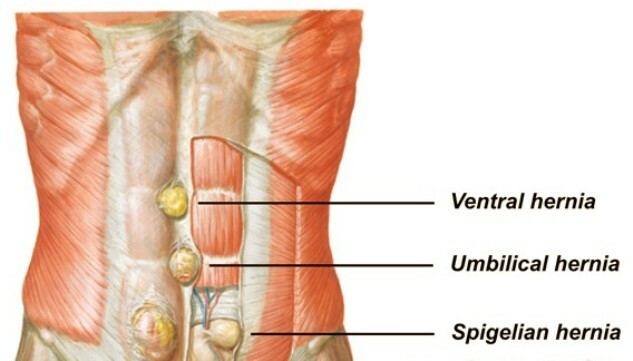 Spigelian hernias often begin around the tissue line which is located on either side of the Rectus Abdominis. One among many other reasons of such kind of hernia is weakening of the abdominal wall. Such kind of weakness occur especially later in life. Other causes can include injury or because of prolonged periods of physical stress. Mostly spigelian hernia is confuse with another type of problem abdominally. As mentioned above, this type of hernia develop through a weakness between the muscle fibres of the abdominal wall. This protrusion may contain a section of the intestines but in other cases it takes the form of an empty sac. it often develop on the right hand side of the abdomen. Du e to its location, no obvious swelling or lump is there which can make it almost impossible to detect. As a consequent, many people with this type of hernia do not even realize that they actually developed a hernia which means that it may remains undetected for a long period of time. Spigelian hernia is considered rare type of hernia which occurs in both men and women alike. It often develops later on in life when the abdominal muscles are not strong and becoming weak. Beside this, they may occur from the same causes of other types of hernias which include any sport that involve excessive twisting or turning, Chronic coughing e.g. from smoking as well as overweight. They are normally located in between the layers of muscles in the wall of the abdomen and easily can be overlooked due to obesity in this area. Here you can find all important information about this disease like its symptoms, diagnosis and treatment so keep reading. The major issue that is generally associated with hernia is their location to develop. Almost all types of hernia are located subcutaneously beneath the fat layers. Although their identification is also difficult but swelling can show that here is something abnormal. But in case of spigelian hernia, it is more complex, because it is found inside the muscles of the walls of the abdomen. Since it is a hernia that is sub-muscular, there is not any external swelling sign or bump with this type of hernia. Besides having no swelling, this kind of hernia is normally very tiny, adding to the difficulty in identifying. The common indicators of this type of hernia are intermittent mass as well as abdominal discomfort. The only sign that make them a bit obvious is pain, only noticeable sign in the actual location. Pain comes and goes on a repeated basis. In terms of size, it is small, and the external soft tissue mass or lump may be felt by the individual, who has little fat in the area that is affecting the abdomen. In addition to pain, which is the only obvious symptom, Irregular or decrease bowel and this tends to remain for more than only one day, can also be a symptom in some patients. Because of the absence of obvious symptoms, this medical problem is extremely hard to diagnose. Mostly it stays concealed for a longer period of time. Usually a good medical exam along with imaging tests are done to diagnose it. Imaging tests are essential to eliminate the doubt for other health conditions. CT scan results can confirm its presence. They are also known as spontaneous hernias since they often created suddenly after trauma or injury to the abdomen area. Chronic coughing can also cause Spigelian hernia. Over weight is generally considered as one major cause of this type of hernia. So keep yourself away from obesity. Tough sport like heavy weight lifting can also cause this medical condition. An inborn defect of connecting tissue, post-surgery infection, pregnancy, abdominal fluid as well as straining during bowel movement or urination are some other causes which may relate with its causes. Surgery is only treatment that can repair this type of hernia, since it is prone to strangulation. Conventional or laparoscopic surgery might be carried out to put any organs that were displaced back in correct place once the contents are detached from the hernia for suturing. The abdominal wall that is injured is toughened with a surgical mesh to stop any recurrence. If this mesh is not in place, the hernia will be more likely to return. Patient’s recovery time is relatively short , usually two weeks. The laparoscopic method is usually favored in order to minimize any chances of infection as well as reduce the stay in the hospital. A post-surgery follow-up exam with the attending surgeon is common in order to avoid any complications.